One of less common myths about publishing eBooks is that proofreading is so easy anyone can do it. 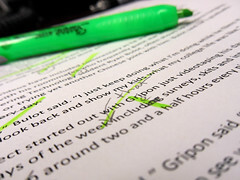 The Society for Editors and Proofreaders (SfEP) wants to show you why it’s not true. The SfEP has put together a brief test which will take you through some common errors usually found in manuscripts. The test is multiple-choice and is based on a short piece of text written just for this purpose.The text is divided into sections and in each section you can delete, insert, or replace text based on the options offered at the foot of the page. When you finish the test, you will be told your score and given the option to try again.